A frequently asked question here at TM1 is how do i replace my signal meter bulb with an LED ? What kind of LED do i need and what size of resistor do i need ? Etc. Well this guide will hopefully answer those questions and anymore you might have regarding LED's. Before you go connecting it you'll need a resistor. The value of the resistor you'll need depends on the supply voltage and the LED spec. But for a typical LED with a supply voltage of 13.8 volts you'll need a 560 ohm 1/4 watt resistor. If it looks too bright using a 560 ohm resistor then slightly increase the value of the resistor. Use the calculator below to calculate the exact resistor needed for your particular circumstances if they vary from the above. Contrary to what you might have seen or read the resistor can be inserted in either the positive or negative lead. Where you decide to put it is up to you. BUT DON'T LEAVE IT OUT. Now there is lots of types of LED's. The ones shown here are 5mm. You might find that 3mm is a better fit. They are often called super / ultra bright LED's. The ones needed for signal meters are known as diffused LED's. Meaning they spread the light evenly. A normal non diffused LED can also be used. But you'll need to diffuse it first using some sandpaper. This only takes a minute. 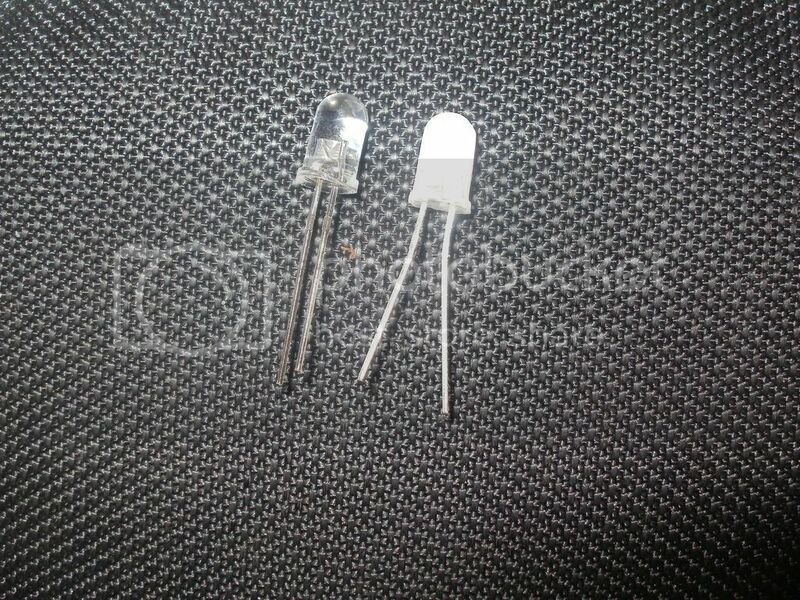 When you've done that the LED will look like the one on the right in the pic below. Don't go mad with the sandpaper. A quick rub is all thats needed. Last edited by Buick Mackane on 08 Jul 2016, 09:46, edited 3 times in total. The wattage of the resistor will depend largely on the current drawn by the LED not the actual R value, as most LED's forward voltage is in the region of 2v, and assuming we are using a 13.8v nominal supply then as you say, 1/4 watt will suffice unless its a extra bright one. Try this site http://ledcalc.com/ as well. From experience white LED's look too 'kitchen', and softer whites are closer to the original lamp. I have found that with some LED's 1/4 watt resistors get quite hot. Also warm white LED's look a very similar colour temperature to a regular filament bulb. If you like that nostalgic glow. Much prefer the standard filament bulb lamp in those rigs that had them fitted as original, I think the LED's are too garish. I see nothing wrong with the soft glow emitted from a filament bulb. Perhaps a poll should be taken as to which everyone prefers. 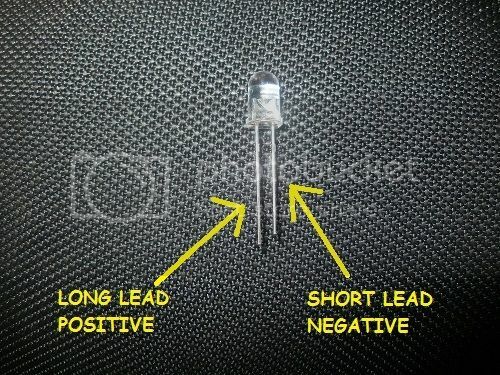 So has anyone posted up a comment on the video telling everyone that LED's have a polarity? I use LEDs now pure and simply because I know that's it for changing them, lamps will blow again within a week to 20 years, the LEDs with the same usage will pretty much last forever. Admiral wrote: I use LEDs now pure and simply because I know that's it for changing them, lamps will blow again within a week to 20 years, the LEDs with the same usage will pretty much last forever. You are correct, but in my defence my eyes are pretty crap these days. Just bought some of these on ebay, Ideal for signal meters, Although you'll need to diffuse them first with sandpaper. You don't have to diffuse them, I have found it makes very little difference. The only issue I've found is that with older HF kit, whilst the dimmer made a big difference on the old lamp installation, with replacement LEDs the dimmer button is virtually useless as there is no noticeable change in brightness. Admiral wrote: The only issue I've found is that with older HF kit, whilst the dimmer made a big difference on the old lamp installation, with replacement LEDs the dimmer button is virtually useless as there is no noticeable change in brightness. Well you could muck about and switch in different values of resistors, But far as i'm concerned a dimmer function on a radio is pretty useless anyhow.